1. What appliances do I need in my Tiny House? 2. How to choose the size of my Tiny House appliances? 3. Are there any limitations to what appliances I can choose if my Tiny House is on wheels? 4. Where Should I Put My Tiny House Appliances? 5. Gas, Propane, Electric, Solar, or Wood Appliances for the Tiny House? 8. Where Can I Buy Tiny House Appliances? There’s a lot to consider when choosing appliances for a Tiny House. Of course size is an important consideration when every square foot—or even square inch—counts. 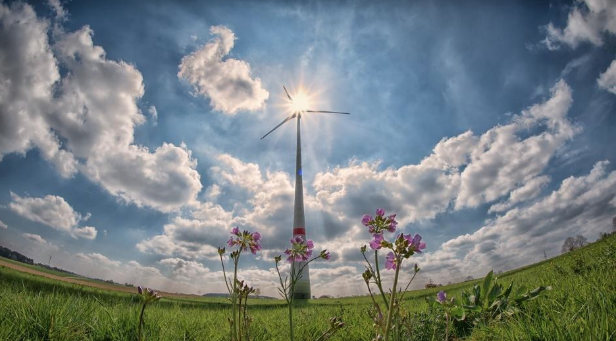 If the Tiny House is intended to be off-grid, or potentially off-grid at some point in the future, it’s important to take appliance wattage and alternative energy compatibility into account. Choosing between propane, on-grid electricity, or alternative energy to power the Tiny House appliances is another important decision. In this article, I’ll take you through the considerations and options for equipping a Tiny House with appliances for the kitchen, laundry area, bathroom, and the entire Tiny House. What appliances do I need in my Tiny House? Here’s a simple checklist of appliances to consider including in a Tiny House. This is a somewhat comprehensive list, and I’m by no means suggesting that every appliance on it should be included in every Tiny House. But it’s a good place to start to make sure nothing will be left out. The items to be included in this section will be highly personal to each Tiny House dweller. I enjoy gourmet cooking and have a rather extensive number of small appliances in my Tiny House kitchen. Everyone will have a different ‘can’t live without’ list when it comes to small appliances. My personal list includes a Vitamix blender, electric kettle, food processor, food dehydrator, immersion blender, spice grinder, clothing iron, and an Instant Pot (which replaces a former rice cooker/steamer and a slow cooker, thus earning its real estate on my countertop). How to choose the size of my Tiny House appliances? Tiny Houses can potentially accommodate either full-size appliances or “miniature” appliances. Miniature appliances might include RV- or marine-specific appliances, apartment- or dorm-size appliances, “compact” appliances, or in certain cases, appliances created specifically for Tiny Houses, as the movement continues to grow and attract marketing angles. The size of the Tiny House appliances depends on available space and usage habits. Tiny House dwellers who dine out on a daily basis may be fine with few minimal kitchen appliances. A large family that enjoys home cooking might be better off with a full-size refrigerator/freezer combo and a reasonably-sized standard range/oven rather than a toaster oven and single burner cooktop. Think about your lifestyle habits and analyze your needs with regards to appliance use. To some degree, think in terms of ‘needs’ rather than ‘wants’ and consider adopting new habits that will allow for simpler or smaller appliances. Are there any limitations to what appliances I can choose if my Tiny House is on wheels? There are a few types of appliances that are less conducive to a mobile Tiny House. Traditional tank-style water heaters are not recommended. In fact, I would say they’re not a great idea for any type of Tiny House, whether on wheels or stationary. They take up a lot of space. And instant/on-demand water heaters are a much more ideal choice for Tiny Houses. Any type of toilet that requires connection to a sewer or septic system is not a good choice for a Tiny House on wheels. Mobile Tiny Houses are better served by self-contained toilet options, such as marine toilets, RV toilets, or the range of compost toilet options. Where Should I Put My Tiny House Appliances? Locating appliances within the Tiny House mainly depends on what will work best for floor plan flow. If any appliances are particularly heavy, as may be the case when choosing full-size appliances, proximity to the trailer tongue and axles should be taken into consideration when the Tiny House is on wheels. Think about vertical placement as well. Not all appliances need be located at counter height. Setting up sturdy shelves above counter height is one way to keep appliances from taking up all of the counter space. Consider ergonomics and think about whether or not the appliance placement will require you to unnecessarily stoop too low or reach too high. I find that my above-counter toaster oven can result in slightly treacherous conditions for removing hot items at a slightly high reach, but it’s a compromise that works for me, given the amount of counter space that’s freed up. Gas, Propane, Electric, Solar, or Wood Appliances for the Tiny House? The choice of power source for Tiny House appliances may be partially dictated by whether or not the Tiny House will be off-grid. Or the decision may be made based on a desire to be eco-friendly. Or it may simply be the result of finding the ideal appliance for your needs and going along with its available standard power source. The largest selection of most types of compact appliances will be powered by electricity. Energy Star ratings are usually available for eco-conscious shoppers. 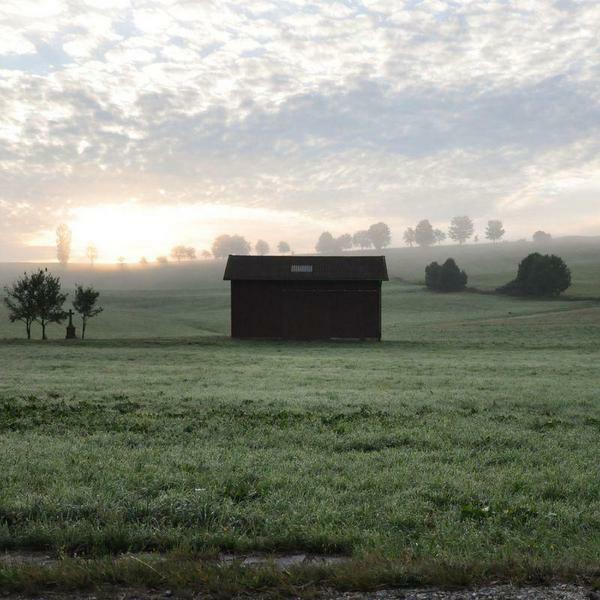 For off-grid situations, the appliance wattage will be of primary importance. Heating appliances are particularly energy-consumptive, so electric options are not the best choice when using alternative energy. Plan your appliance layout around the placement of electrical outlets, or vice-versa, if your appliances run on electricity. There are some great options, often from the marine and RV industries, for gas- and propane-fueled appliances. Instant hot water heaters often fall into this category. Cooktops are a good choice here as well, especially for those who enjoy cooking over flame. Propane-fueled heaters can be a good choice if energy consumption is an issue, as with off-grid situations. Other appliances that are available in gas or propane options include ovens, oven/range combos, refrigerators and freezers, washers and dryers. I find it convenient to keep propane tanks in a well-vented exterior closet or compartment that’s not connected to the interior of the Tiny House. This makes it easy to remove and replace either of my five-gallon tanks for refilling and keeps the fumes out of my living space. I keep a simple weight-scale propane gauge in the exterior propane compartment and try to remember to check it regularly. It’s a good idea to have a second full tank on hand for back-up purposes. Trust me, it’s not a pleasant to run out of propane for the instant hot water tank in the middle of a shower in the winter time. But in four years of Tiny living, it’s only happened to me once. The lesson was well learned. 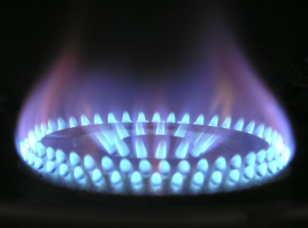 Natural gas appliances can be used with propane if an LPG (propane) and natural gas conversion kit is installed. A wood stove can be a viable option for accommodating heating and certain cooking needs. After all, cooking and heating with fire is the original way of going about it. If you choose this route, make sure you have ample air inlet to your Tiny House while using the wood stove. It’s a good idea to install a carbon monoxide alarm to stay on the safe side. And maintain all recommended clearances from combustible materials. 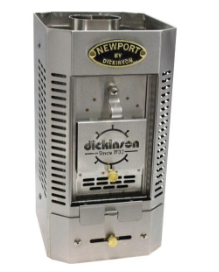 One of the smaller options for a Tiny House wood stove is the Dickinson Newport Solid Fuel Heater. Its dimensions are 7.88 inches wide by 14.7 inches high by 10 inches deep. It’s recommended for boats 20-25 feet long (and presumably for Tiny Houses of a similar size). It can burn wood, presto logs, coal, or charcoal briquettes. 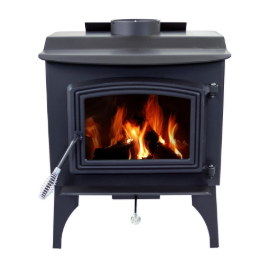 The Pleasant Hearth WS-2417 is a freestanding EPA-certified wood burning stove that heats up to 1200 square feet. Its dimensions are 21.5 inches wide by 22.88 inches deep by 28 inches high and it accommodates logs up to 18”. Various barbeque or grill options; a Traeger grill has the capacity to cover a range of kitchen oven tasks, including grilling, smoking, baking, roasting, braising, and barbeque. Tiny House appliances run the gamut from luxury models to budget-friendly. Here is a sample range of available products for each category. The Sun Frost RF16 is available for a whopping $3,445 for the DC version (slightly less for the AC version). 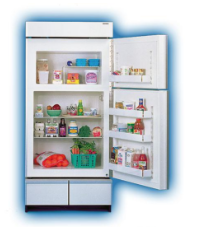 This is a highly energy-efficient refrigerator-freezer combo that’s an excellent choice for off-grid living. The basic model is white but custom laminates and wood veneers are available for an additional fee. It can be found here. 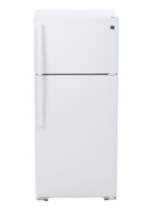 A popular choice among the many mid-range Tiny House refrigerator options is this 15.5 cubic foot refrigerator with top freezer from GE priced at $448. 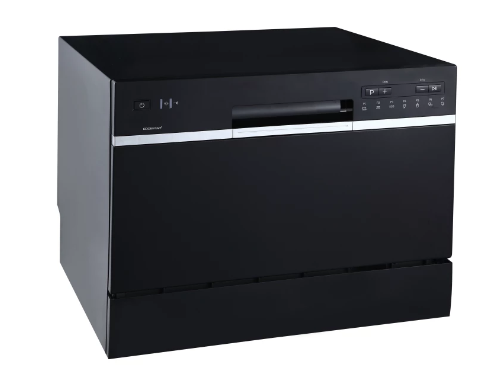 It comes with customizable humidity drawers for produce, adjustable shelves, and an optional ice maker. Color choices are white or black. It can be found here. 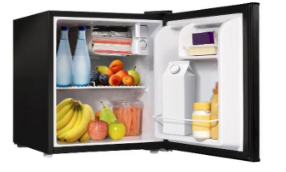 For minimal refrigeration needs, this Sunbeam 1.7 cubic foot mini-fridge for $85 might fit the bill. It includes a tiny freezer and doesn’t take up much real estate in a Tiny House. Color options are black or white. It can be found here. A marine model such as this Three-Burner Gourmet Galley Gimbaled Propane Range from Force 10 can be a great choice for Tiny Houses. It will set you back $1600. As the name suggests, it runs on propane and does not require an electrical connection—only one AA battery. I can vouch for the quality of Force 10 products based on my experience with one of their propane cooktops, though I use a separate convection toaster oven (by Breville) rather than a combo unit. The Force 10 range can be found here. 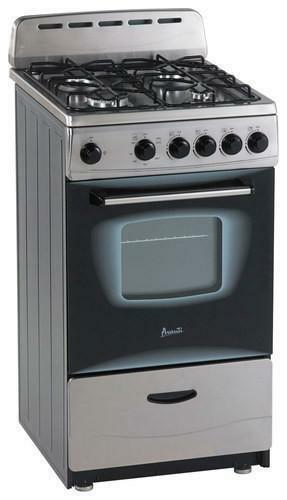 A popular mid-range model is this Avanti 20” free-standing gas range available for $499. 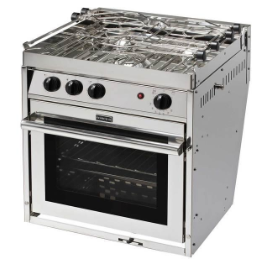 It has four burners and an automatic electronic ignition, and comes with two oven racks. It can be found here. A portable propane cooktop, often used for camping, can be a great budget option for those whose cooking needs are less extensive. Rather than requiring a fixed location in the Tiny House kitchen, it can be stowed away when not in use, freeing up countertops for other purposes. Be aware that many camp stoves are not intended for indoor use, so consider restricting cooking activities to the porch or another outdoor space. 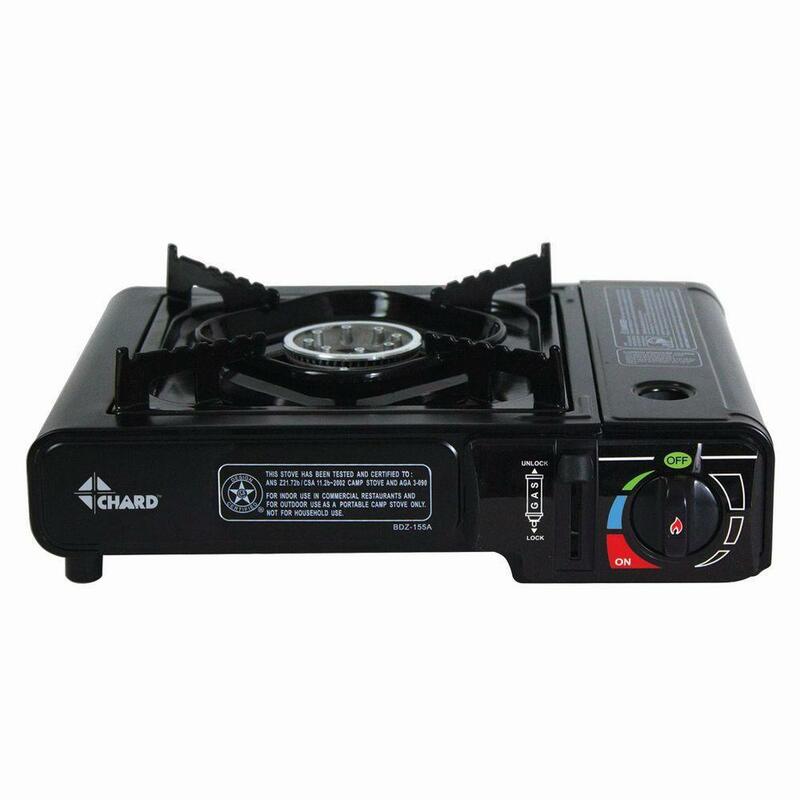 The Built-In Single Side Burner Camp Stove by Chard can be had for $23. It runs on butane canisters. It can be found here. 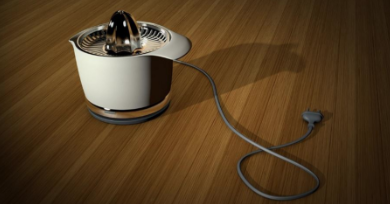 A budget option for those who prefer to cook with electricity is an induction burner. Unlike traditional camp stoves, induction burners are approved for indoor use. 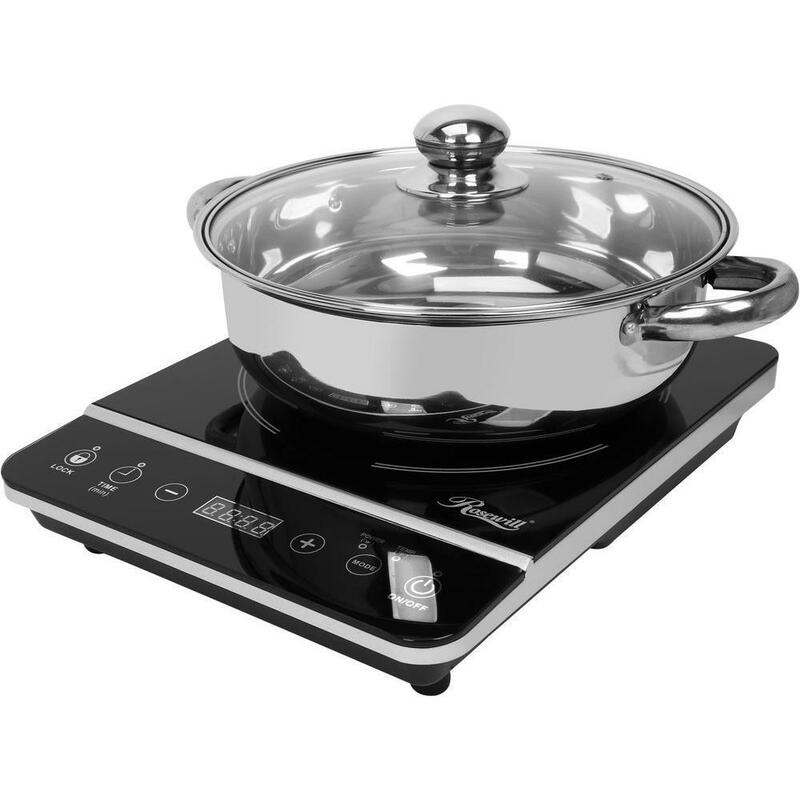 The Rosewill 1800-Watt 8 Temperature Setting Induction Cooker goes for about $50. It allows you to energy-efficiently braise, deep fry, stir fry, roast, or boil water. Find it here. 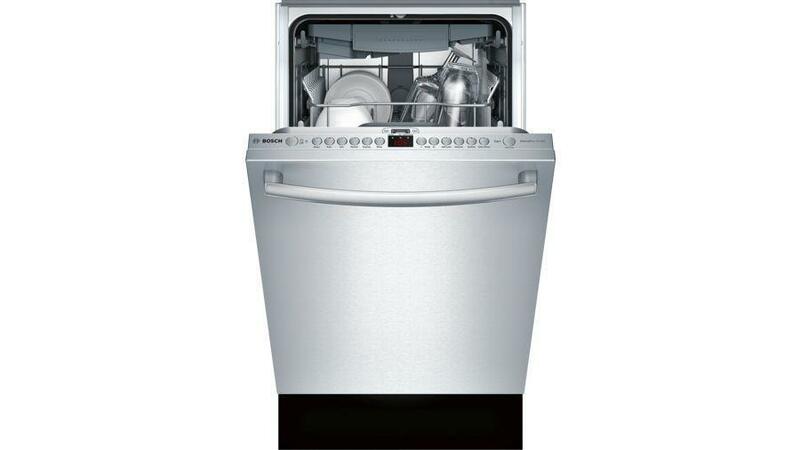 The Bosch 800 Series SPX68U55UC Stainless Steel dishwasher is an energy-efficient model that offers a half-load option, 9 possible rack positions, and 4-part leak protection for $999. It’s touted as having especially quiet operation. It can be found here. The Edgestar 22 Inch Wide 6 Place Setting Energy Star Rated Countertop Dishwasher is a portable unit that can sit either on a countertop or anywhere that allows its five-foot hose to attach to a faucet. It has capacity for six place settings, comes in black, silver or white, is Energy Star rated, and has seven wash cycle settings. It has a price tag of $269. Find it here. 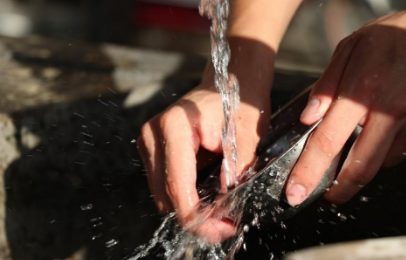 This is the option that makes by far the most sense to me: hand-washing the dishes! It’s free, easy, and even meditative if approached with that attitude. It doesn’t require any power or fuel to add to your utility bills. And it doesn’t require any space in the Tiny House, other than for a dish drying rack or mat that can be stowed away when not in use. If your counter space is precious, as is often the case in Tiny Homes, find a rinsing/drying rack that fits directly over the kitchen sink. The LG SIGNATURE 24” Washer/Dryer Combo with SideKick Pedestal Washer has a capacity of 3.5 cubic feet and dimensions of 33.5” high by 23.6” wide by 26.5 inches deep. It runs $3,638. The unit boasts a direct drive motor in the pedestal that saves energy and has less moving parts than traditional motors and a stainless steel drum. It can be found here. The Magic Chef 24 Inch Wide 2.0 Cu. 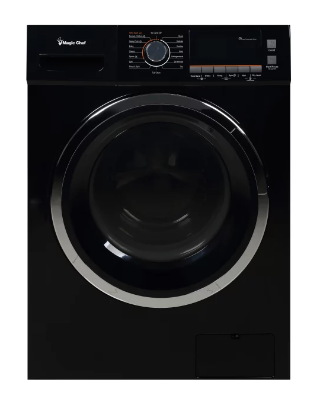 Ft. Front Loading Electric Washer / Dryer Combo with Ventless Drying Technology includes a stainless steel drum and five load settings. It also has a timer that allows the start time to be delayed up to 24 hours. Color options are white or black. Its size is 33.5” high by 23.5” wide by 22.375” deep. Its price is $740. Find it here. 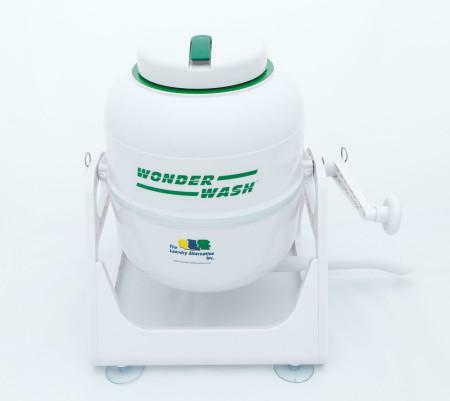 For the budget-minded who don’t mind powering an appliance with elbow grease, here is the WonderWash for $49. Its compact size and portability allow it to be stowed away in a closet when not in use. Its low water usage increases its eco-friendliness. It can be found here. 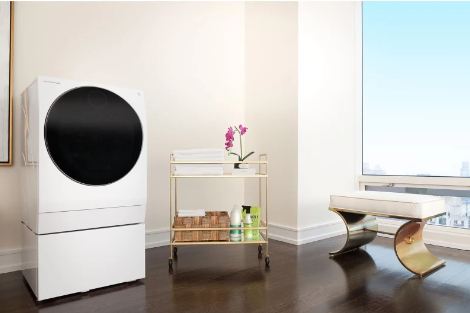 Line-drying laundry is a viable option to pair with any clothes washer. Clothing can be hung to dry indoors when weather outside isn’t conducive to drying. I’ve been employing this method of clothes drying the entire time I’ve been living Tiny, and have no qualms recommending it as a workable solution. Large items like bedding can be challenging when outdoor drying isn’t an option, so occasional trips to the laundromat or a friend’s house to use a standard size dryer can be helpful when the need arises. 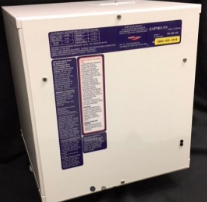 PrecisionTemp’s RV-550 NSP EC water heater is a unique floor-vented model designed for use in four-season climates. It runs on propane and there’s no pilot light. The price tag is $1,125. It can be found here. 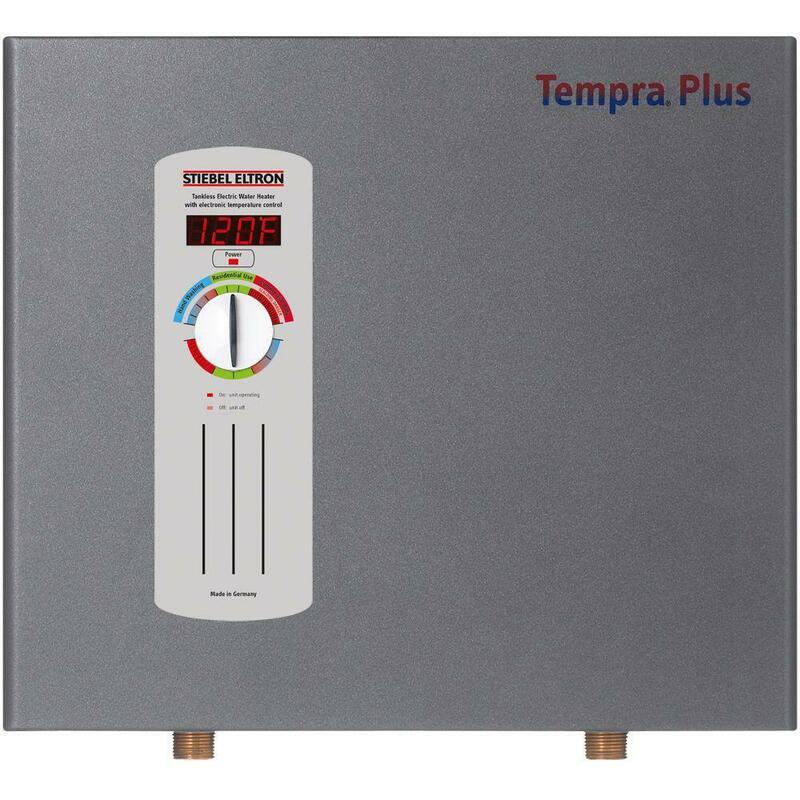 The Stiebel Eltron Tempra 24 Plus Advanced Flow Control and Self-Modulating 24 kW 4.68 GPM Electric Tankless Water Heater runs on electricity rather than propane. It includes water overheat protection technology with a thermostatic control range of 86 to 140°F. The unit requires no venting. It has a $698 price tag. Find it here. 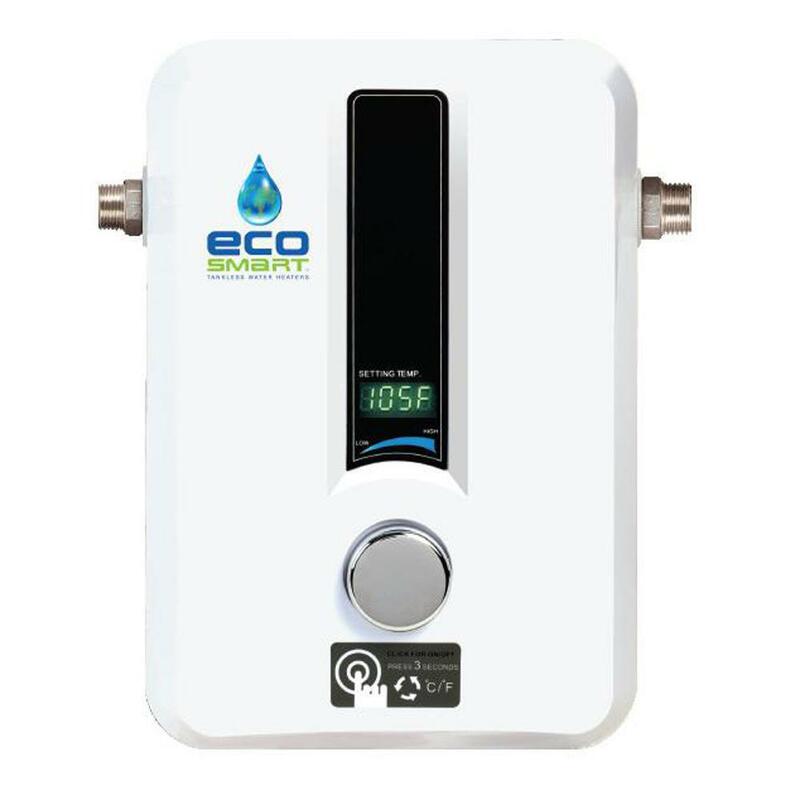 The EcoSmart “Eco 11” 11 kW Self-Modulating Electric Tankless Water Heater runs on electricity, as indicated in the name. It heats up to two gallons per minute, claiming to be appropriate for 2-person use in a small apartment. It runs $250. Find it here. Where Can I Buy Tiny House Appliances? From in-person brick-and-mortar shopping locations to websites, there are plenty of options for Tiny House appliance shopping. Here are a few ideas for where to start. It’s by no means a comprehensive list, as I’m assuming you know how to use Google (or your search engine of choice). Amazon is considered the king of customer service. If nothing else, it’s a good place to read reviews from product users. 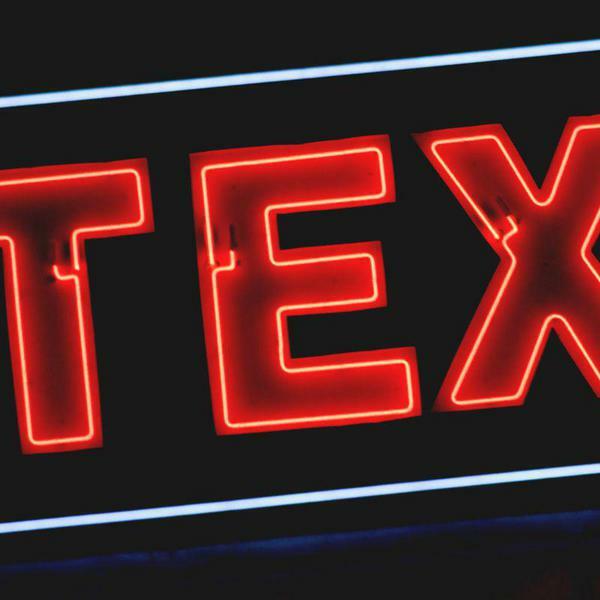 Take the reviews with a grain of salt, as there’s been a bit of a racket involving incentive-based slanted reviews there; look for the ‘verified buyer’ label. Free shipping is often an attractive component of Amazon purchases. They also offer fee-based installation services. And extra warranties beyond the standard offering of the manufacturer can often be purchased. Returns are generally very easy. After making a product choice, shop around online, as Amazon is not always the best buy in town. Compact Appliance has a nice range of products and the support of a Learning Center that provides useful information when shopping guides are needed. They claim to be one of the top 500 Retail Web Sites as reported by Internet Retailer Magazine. Many of their products include free shipping. Home Depot and other major home improvement stores can be shopped in person or online. Or order online and pick it up at the store. Many items come with free 2-day delivery. They offer installation services and tool rental. It can be hit or miss for knowledgeability when it comes to store staff. Ben’s Discount Supply has a Tiny House department on their website. They offer new, used, and ‘scratch and dent’ appliances. The website is easily navigable by category. Buying pre-owned Tiny House appliances can be a great way to save money but be highly cautious when doing so. In my opinion, the peace of mind that comes from new, warrantied appliances outweighs the dollars saved by buying used. When an appliance malfunctions, it can mean a big headache and expense to repair, or uninstall and replace. There are other aspects of Tiny House construction that are better suited to used materials. ‘Scratch and dent’ or display models can be a better way to save cash without compromising on quality. Online resources such as Craigslist can be a good place for bargain hunting, but exercise discernment when taking a look at the offerings. If your personal knowledge about the workings of the product isn’t solid, bring along someone more knowledgeable who can advise you on whether or not to buy. Habitat for Humanity stores are another good outlet for those who feel confident about purchasing pre-owned appliances. And if your neighborhood has an active Buy Nothing group on Facebook, you may even be able to nab some perfectly good appliances for free. The additional benefit of this option is that you can ask for exactly what you want, and cross your fingers that someone will respond with exactly what you’re looking for. There are plenty of options to be had when choosing Tiny House appliances. The primary considerations to apply to the array of choices are budget, energy source, and available space. Review the comprehensive list of Tiny House appliances and determine which ones can be lived without and which ones are absolute necessities. Consider portable appliances that can be stowed away for more flexibility with your space. Once the list is narrowed down, it’s time to go shopping. Decide whether to opt for new or used appliances. Check out my suggestions for websites and physical stores to explore, or grab your favorite search engine and start surfing. 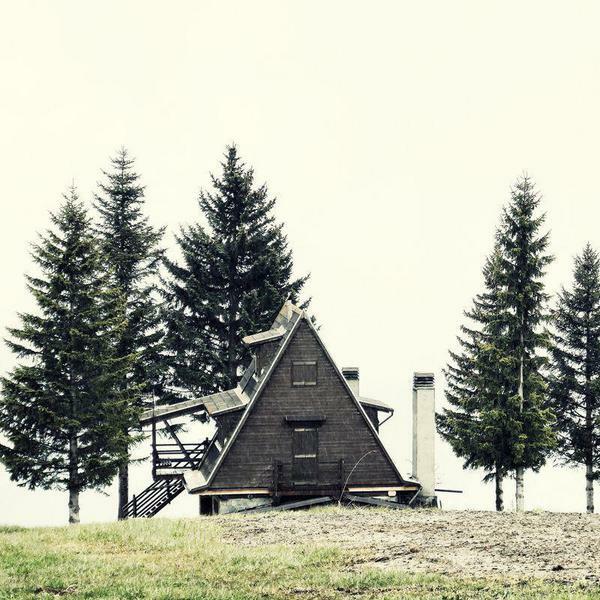 Visit Tiny House dweller’s blogs to find out what other people are using and whether or not they’re having good experiences with their choices. Be creative and flexible in considering new ways to accomplish your home chores and tasks; you may find that you don’t need an entire “laundry list” of appliances. Then again, maybe you do. There’s something to be said for time-saving devices… and the Tiny life speaks well to reserving our time for the things we most love to do!